a look at the basic answers. Having of course no world government, and no real global consensus on dealing with poverty, cutting poverty is chiefly for each country to deal with. There has been a little international aid available for this, though often with unwanted conditions attached, but it still relies on individual governments not all of which consider poverty bad. And the possible solutions for poverty clearly depend on what is chiefly causing it, and this can clearly vary with time and with place. The early 21st century sees the main poverty differences as between majority poverty as in poorer countries like India, and minority poverty in richer countries like the USA and Britain. None of it may be easy to solve and the long history of anti-poverty measures has often been of failure, but successful action on poverty reduction is really possible. Yet large numbers of people are still living in poverty which the FAO 2003 World Hunger Map below indicates. In this map darker is poorer, see our Poor In a Rich World section for more current maps. 1. Poverty in poor countries. There are unfortunately today still many very poor countries especially in Africa, Asia and South America where the majority of their populations still now suffer absolute poverty. For such countries where the poor are a majority, the first requirement is to convince the richer countries that they will benefit by abolishing poverty worldwide. But many in the richer countries, including their governments, may have wrongly come to actually liking having poor countries and to also believing quite incorrectly that having poor countries benefits richer countries economically. But having poor countries is not an economic benefit to anybody, and it chiefly encourages low productivity in the richer countries by their employing or exploiting in the lowest wage poor countries. There is also no doubt that accepting having poor countries involves world fractures causing wars and other serious problems that our world would really be much better without. Accepting having poor countries can only encourage international badness rather than goodness, and it also encourages accepting poverty within richer countries. The richer countries really need better education on this. If richer countries can be taught correctly the real problems of accepting poverty, then it is in principle a relatively simple matter for governments of rich and poor countries together to gradually end poverty worldwide with improving international trade terms and international government and charity aid systems. And lower-level universal right welfare systems could also work well in many poorer countries, along the lines noted below for richer countries. But richer governments and charities actually choose which poor countries to help, usually giving no help to those poor countries whose governments are considered 'unfriendly', and they also choose how to help. Giving food is often prioritised, and in some immediate crises this is essential - but food aid alone may not reduce poverty at all in the longer term. And some 'help' can actually involve rich countries exploiting poor countries. Richer countries governments and charities who want to help poorer countries really need to more closely study the actual needs of each poor country. Increasingly many poorer countries are getting better at helping themselves emerge from poverty especially by prioritising education. Hence some poor countries are at last catching up in innovation and science, see Innovation in the Third World. 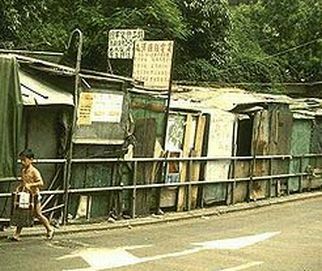 Recently poverty has been greatly cut in China and it can be cut elsewhere. 2. Poverty in rich countries. In richer countries, like the USA and UK, where their poor are a minority the first requirement for any real solution to that poverty is to convince the majority in those countries that they will benefit by abolishing poverty in their own country. But many people in such countries have come to like having a poor minority and to believing wrongly that having a poor minority benefits the majority economically. In this mistaken belief their governments may encourage immigration from poorer countries for cheap labour and adopt other policies to maintain poverty. But having a poor minority is certainly not any real economic benefit, and chiefly encourages exploiter inefficiency in businesses employing poor workers on the lowest possible wages. There is also no doubt that accepting having a poor minority involves social fractures worsening crime and other serious social problems that any society would really be much better without. Claims by some that 'generous welfare for the poor discourages working' are false - see Welfare and Work. The richer majority need teaching correctly how having a poor minority is really bad for themselves. It is then in principle a relatively simple matter for governments in richer countries to essentially abolish their minority poverty with improving minimum wage law and welfare systems (as the universal-right basic income welfare system proposed on our sister site Social Exclusion Housing and now being considered by some governments as a 'basic income guarentee'.) - while dealing with any social exclusion issues existing for their poor as also dealt with at that sister site of ours. 2009 saw Europe having legal Minimum Wage levels varying from around £200 a month to around £1,200 a month, with some high wage unionised countries having no legal minimum wage as in Scandinavia - and many poor countries also having no legal minimum wage. With better understanding of the real poverty issues, private charities could also help more than they do now. While charities may need to use only attempted-targeting means-tested welfare, a government universal welfare for all better fits smaller, less interfering and more democratic government. While government 'targeted welfare' empowers controlling governments, universal welfare by right empowers the people. And as everybody needs at least a minimum income, a government Universal Benefit approach makes sense. Of course not all of the poor would immediately respond perfectly, as not all of the rich behave well, but that calls for good government with good education. It would certainly make unemployment less of a problem for many people, but might require higher taxes and might tend to attract more immigrants to that country and so need more immigration control ? 2019 sees the progressive government of Finland giving a trial selection of 2,000 unemployed adults a condition-free and tax-free basic income of £475 a month for 2 years, more than the UK government Jobseekers Allowance though below Finland's Jobseeker Allowance. Supporters say it will make people happier, healthier and more productive though sceptics doubt the latter, but of course conditional Jobseekers Allowances only pay as long as people are unproductive and so reward being unproductive. https://uk.news.yahoo.com/finland-gives-basic-income-radical-154721106.html 2019 also sees a universal basic income being considered by governments in Switzerland, Netherlands, France, Canada and the UK with some test pilots planned. The Universal Income was first proposed for all adults by Thomas Paine the revolutionary in 1797 when there were generally no welfare benefits, and could allow adding targeted additions according to need. It might work best as a basic income for all issued by government sufficient for a reasonable basic living, per adult and per child with the child amount for age below 11 paid fully to parents but half paid to the child from age 11 by schools ? It would be a simpler means of dealing with poverty that also helps give the poor more self-control and motivation for betterment. However, actually governments and charities choose who to help and how, and the amount of help will also be limited. Both will largely be run by people who have little contact with or understanding of poor people, and both may advise private individuals not to try to help poor people directly, but only through them. In richer countries, governments and charities may need educating themselves about handling the poor in their country, for it is certainly unfortunately common that those offering help to the poor do it so inappropriately as to do more harm than good. The very successful poverty-reduction in China in recent years has largely involved government action to encourage improved farming productivity and to employ the released labour in expanded industry, combined with population control. At least some poor countries could copy that policy approach successfully, especially if given some appropriate help. 3. The more urgent priorities. 1. Improving the training and equipment of farmers related to agriculture and natural resource management, to help increase crop yields and conserve the environment. 2. Improving opportunities and incentives for young females to have children only when they can assure their wellbeing. 3. Improving supplies of clean water, to reduce time spent gathering often foul water and reduce illness caused by foul water supplies. 4. Improving the supply of accessible, affordable health care information and services, to reduce the vulnerability to disease of children and the elderly especially. 1. Improving work opportunities and incentives for the poor so they can provide well for themselves and their families. 2. Improving the quality of education for poor children and education opportunities and incentives. 3. Improving opportunities and incentives for poor young females to have children only when they can assure their wellbeing. In some countries, inadequate education is chiefly helping maintain poverty for many. In some countries, inadequate medicine is chiefly helping maintain poverty for many. In some other countries, war or bad government or limited resources or a mix of reasons is helping maintain poverty for many. With global poverty, the main immediate problem is too many believing wrongly that poverty is necessary or is even good ! (and not enough giving to good poverty charities) The main problem is actually bad education about poverty, though other detailed problems do vary - as other areas of this site show. # Recently increased concern about terrorism, and it being encouraged by poverty, may have somewhat boosted support for abolishing poverty being a benefit for the non-poor also - as see eg UK Eliminating World Poverty pdf. OR see an interesting science theory website, on Albert Einstein, Sir Isaac Newton, Rene Descartes, William Gilbert ? IF you run a website, you are welcome to link to this site.